I haven’t made breakfast for the fam in a while. I did a quick Google search of “waffles” and found this highly rated recipe on Epicurious.com. At first I balked at the “3/4 stick of butter” and almost passed this one up. Then I read the amount of waffles this batch makes and didn’t feel too bad about it. In my opinion, there are many more breakfast items out there with lots more “bad stuff” in it than these. 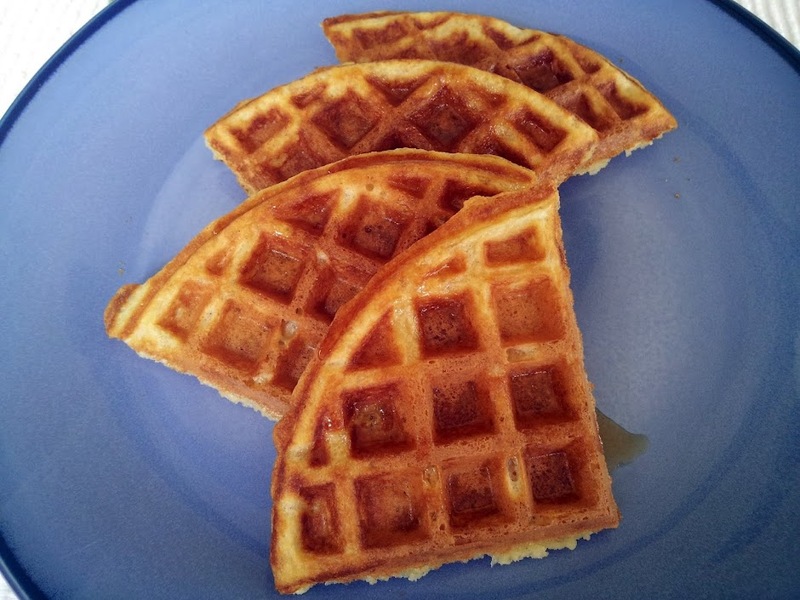 This recipe is similar to one I tried earlier, so I wondered what qualified this as a “Belgian” waffle – I thought maybe it was all the butter (the other recipe used oil). It was just a guess but apparently it’s the height from yeast and deep pockets that make it a “Belgian”. According to my search, this version is similar to a “Brussels” waffle. I have a yeasted waffle bookmarked for future experimentation, but I don’t wake up that early on the weekend to wait for a rise – or remember to plan ahead for it. Verdict: These were really tasty, nice and buttery but not greasy; and I liked them even more the next day out of the toaster. The waffles get a little crunchy and I don’t even need maple syrup. I will make these again 🙂 Thanks for reading, enjoy! Brush hot waffle iron lightly with vegetable oil and pour a slightly rounded 1/2 cup of batter into each waffle mold (see cooks’ note, below). Cook waffles according to manufacturer’s instructions until golden and cooked through, about 3 minutes. Transfer as cooked to rack in oven to keep warm, keeping waffles in 1 layer to stay crisp. Make more waffles in same manner. Still am in desparate need of a waffle iron – they always look so pretty. Love the use of buttermilk, it’s such a fantastic ingredient.